HOMEsteady Life | One's quest to live an independent, conscious, and creative lifestyle. Oh, how grateful I am to be able to write not just one, but a second homebirth story. My first homebirth, which you can read all about here, was a beautiful and peaceful, yet rather long story. I had an easy pregnancy, despite sciatica pain during my last month, and practiced self-hypnosis with the Hypnobabies Home Study Program. I was so thankful I had self-hypnosis to help me through that marathon birth. I never felt pain, just intense pressure, but was utterly exhausted by the end. This second pregnancy was not nearly as easy for me mentally, emotionally, or physically. You can read more about my first trimester here. I felt pretty good physically during my second trimester, but had a few emotionally challenging times during those months that required a lot of inner strength to stay positive and stress-free for the sake of my sanity and the baby’s health. Then I had pretty intense lower back, hip, and pelvic pain during my entire third trimester. Thankfully prenatal massage and chiropractic care brought on great relief, but didn’t make it go away entirely. Even though I still had a positive experience with my first home birth, I was definitely less confident this second time around. I was mostly worried it would be just as long, but I wouldn’t be as mentally prepared as the last time. I wasn’t able to study Hypnobabies nearly as much as I should have because my 2.5 year old son, L, at the time had a month-long nap strike after we returned from vacation, which made it much more difficult to find the time to mentally prepare. I just kept praying for strength to trust that my body and mind knew exactly what to do and that God would not give me anything I could not handle. The night before my second birth began, I broke down in tears to my husband expressing all my fears about the upcoming birth. By the end of our talk, I felt much more at peace and remembered I had a similar experience the week before my first birth. The next morning, I was supposed to have my 38 week visit with my midwife’s assistant, who was also at my first homebirth and would be taking over for my main midwife while she was on vacation for the month. She was also pregnant in her first trimester, but was not sure if her nausea was from that or a stomach virus, so she wanted to wait another day to come over, just in case. My girlfriend Meghan called and we ended up discussing details of both our homebirth stories which again led me to be much more at peace with what my upcoming birth would bring. After I hung up the phone, I put L down for his nap, ate some lunch, and decided to lay down on the couch to rest. I looked up restaurants in town to make a reservation for that weekend for one last date night with Matt and continued reading a book on healthy baby sleep habits, determined to get better sleep this time around! All of a sudden, around 2pm, I realized my Braxton Hicks contractions were no more as they required my full attention. I felt a stretching-burning sensation wrap around my back, which I knew full well from last birth was an actual pressure wave (PW – Hypnobabies term for the word “contraction”). They lasted about 30 seconds and were about 15 minutes apart. Around 3pm, my son awoke from his nap and I decided I should text my midwife and Matt to let them both know something was happening. Knowing my last birth’s history, I told them both it was probably nothing but prodromal labor, and I was fully convinced I would be feeling these sensations for the next two weeks. She told me to keep her posted if they lasted 60 seconds and got closer together. I downloaded a contraction timer app on my phone to keep better track, and played with my son in his room. Each PW continued to require my full attention, and I even needed to change my breathing through them. Still, I was convinced it was nothing. Shortly after 4pm, Matt called to say he was on his way home and asked if I was still planning on going to my prenatal yoga class. I told him I wanted to, but it probably wasn’t the smartest idea to drive by myself since I had to close my eyes and focus during PWs. I was in complete denial that I was actually in my birthing time. He said he would shovel snow off the deck and turn up the hot tub when he got home in case I wanted to relax in it, and would take care of our son so I could rest or do whatever I felt I needed to do. My midwife also checked in around the same time, so I sent her a screenshot of the times on my phone app. PWs were about 60 seconds long and 5 minutes apart. I told her I still didn’t think I needed her to come over, since we both knew how long my last labor was, it still may be awhile. She reminded me that my body had already passed a baby through it’s bones, so it would probably go faster this time. I was still in complete denial. I laid down in bed and began listening to my Hypnobabies birthing affirmations. During this time, around 6:15pm, my other midwife called to check in. She lived almost an hour away and wanted to gauge how much time she had to give herself to drive here before the baby was born. I told her my PWs had slowed down to about 8 minutes apart, but during the less than 10 minutes I was on the phone with her, I had two about 4 minutes apart, and I had to stop talking to her and breath through them. She mentioned this and asked if I had any bloody show, which I had not seen any yet. Once I hung up with her, I decided to go to the bathroom and there it was, bloody show! I told Matt, and asked him to text the midwife to let her know it was actually happening and to come over. I was finally admitting to myself I was going to birth my baby! Then I moved back to the bedroom, sat on my birth ball listening to Hypnobabies’ “Easy First Stage” track on my iPod, while Matt and L helped set up the birth pool. He tried several times to get a hold of Meghan who was planning to come help during the birth but there was no answer. He said he was calling one last time, and then he would call his mother to come help with our son, but thankfully she picked up the last call with the feeling I was maybe in labor! My midwife arrived, we made some small talk in between PWs about 3 minutes apart and getting things ready, while Matt put L down for bed. My son really wanted me to say prayers with him before bed, so we all prayed together, while I was breathing through PWs. I was so thankful he insisted on that! While Matt read him books in bed, I went and laid down in my bed to rest. My PWs seemed to slow down again so after he was done putting L to bed, I called Matt in to lay down with me for a little bit. After some time, I wanted to go to the bathroom to empty my bladder to help keep everything moving along. Once on the toilet, my PWs picked up in time and consistency. I hung my arms over Matt’s shoulders so I could better relax my pelvic floor while sitting on the toilet. I remembered being in that exact place during my first birth when my water finally broke and my body began to push, so I wanted to stay there for awhile. Matt innocently asked if I wanted to go lay down again since it seemed to be less intense in that position, and my midwife and I both exclaimed, “No!” And she explained that intensity was good and we wanted to keep the birth progressing at that pace. During this time, the other midwife arrived around 8:30pm and Meghan arrived around 9pm, after needing to shovel her car out of the snow. She tried to help calm my son who was laying in bed crying out for me, “Mama, lay down 5 minutes!”, but he would only tolerate Matt, and I didn’t have 5 minutes to spare, so they took turns being with me in the bathroom. The birth pool was finally full enough with warm water for me to get in so I walked to the bedroom trying to explain to Matt where my one specific hair clip and bra was that I wanted to wear while in the pool. I had almost everything laid out in preparation but not those items yet! I had one more PW while they helped me get undressed, and then I got into the pool which felt so good. I had another PW in the water and realized my body had started pushing! I was so surprised. I had no idea I was that far along already, I thought I had to go though transformation (transition) still! This is how manageable everything was up to that point. My midwife agreed that my body was probably ready to push and I would be feeling my bag of waters bulging soon, and once it broke, the pressure would be much less intense. I was so excited! In between PWs I kept telling everyone how nice it was to be so present and not utterly exhausted this time. I could actually feel the sensations of my baby moving down and out. It was amazing. Finally my water broke and the excitement in the room grew even more, knowing the baby would join us any minute. I was so relieved when it finally happened because a lot of the pressure then disappeared. My midwife noticed some vernix, the waxy substance that coats newborn babies skin, floating in the water noting that the baby maybe had more vernix than my last since he was coming two weeks earlier. I laid with my back against the side of the pool, with my left hand in my husbands and my right hand in Meghan’s, not squeezing at all, rather using their beautiful positive energies to help me relax every muscle in my body. My body was shaking in between contractions, which my midwife told us was my hormones simply trying to help me relax my muscles, so it reminded me to take a deep breath and go “limp and loose” like Hypnobabies teaches, but since I wasn’t in deep hypnosis during this birth it didn’t happen as naturally. I let go of all tension in my body and the shaking would stop and the baby descended a little further. While I was pushing, Matt was going in between our bedroom and our sons bedroom, tending to him as he continued to call out for me this entire time. I contemplated just having him come in to our bedroom to watch, but I wasn’t sure if it would make it worse or not, because he really was just exhausted and wanted me to lay down with him. Later, Matt said he wondered the same thing, but he didn’t want to cause any stress for me by having him in the room if he didn’t really want to be there. I joked afterwards that we were both yelling out together. Once my baby’s head emerged, everyone almost cheered with excitement. It all was happening rather quickly and seamlessly, and just so calmly. My body knew exactly what to do without any interventions and it truly was a natural, normal, healthy life experience. I definitely felt the “ring of fire” much more this time without the deep hypnosis, but I just tried not to focus on it, knowing it would only last a moment and my baby would be here. It was incredible to then feel the baby start to turn to come completely out. My midwife asked if I wanted to get my hands ready to catch my baby, but I wanted Matt to experience it this time since he wasn’t literally holding me up like last time. One more push and our baby was earthside! Matt caught our baby while our midwife gently unwrapped the cord that was loosely around the baby’s neck, not cause for any concern. Then he and I brought our baby to my chest while Matt moved behind me. The midwives and Meghan were all surprised how much they thought the baby resembled my son, but I immediately saw all the differences, especially the nose! I’m pretty sure I said, “Hi Baby!”, and immediately asked for someone to please go get our son from his room since he was still awake and calling out for me. Matt brought him to our room and then I put the baby on my legs so we all together could see if it was a boy or girl, and a boy it was! We all were shocked. Everyone thought it was a girl but God knew a baby boy, a little brother for our son, was exactly what our family needed at this time! Big brother immediately asked to go back to bed and he fell fast asleep knowing all was right in his world. I asked what time it was when he was born and was shocked to hear it was only 10:07pm, just 8 hours from the first time I felt pressure waves begin! I really wanted an 8 hour birth or shorter this time, and God provided. Once the cord stopped pulsing, Matt cut it and then took off his shirt so he could hold our baby boy skin-to-skin against his chest while I got in an upright half-squatting position to better birth the placenta, which came out about 20 minutes after birth. I was then assisted out of the tub and into a robe and moved to the bed for lots and lots of snuggles. The midwives did all the routine newborn checks and everything was perfect. Even being two weeks early, he was surprisingly bigger than his brother! He was 19 3/4″ long and weighed 7lbs 4oz. We called and/or Facetimed with our parents, waking some, to share the good news. Everyone was shocked he came two weeks early. My parents were still out of town on vacation and Matt’s mom was coming down with a really bad cold, so unfortunately it was several days before they got to finally meet him! The weather also turned bad so we were holed up on our own for the first couple of days postpartum, which wouldn’t have been so bad had Matt not thrown out his back the very next day, leaving us both in pretty rough shape, especially when trying to care for a very active toddler too! I decided to have my placenta encapsulated this time, as well as tinctured, and also had an art print made from it as a keepsake. It was something I came across during my first pregnancy, but ended up just burying my sons placenta under a tulip tree a friend gave us to plant. So far I have had good results. Maybe one day I’ll write about it here. For now, thank you for reading my second son’s birth story! Yup. We are anxiously anticipating another baby! If you thought I had been extra quiet around here, you now know why. Not only do I not want to sit at a computer during the summer months when we’re outside as much as possible, but I also haven’t been feeling my best either. I’m fortunate to still not experience typical “morning sickness”, but there really is no type of exhaustion like pregnancy exhaustion, especially when home with a toddler! This time around has definitely been more intense and challenging, both physically and emotionally. I had about two weeks (around weeks 6-7) where I found my body refusing to do anything but sit or lay down. And then of course my son would scream at me to get up. And if I was anywhere near the hot sun, forget about it. Wooziness would set in. Then during Week 7 Matt got into a motorcycle accident and that same day I started spotting. Thankfully, there were no broken bones, just severe road rash on both arms and one knee, and the spotting only lasted two days. Those two days were rather emotional times. We were pretty pathetic though, each trying to help the other out but not really able to do more than try to take care of ourselves and our son. Luckily I started to feel a little better and gain a little more energy during that 8th week and it has very slowly gotten better each week since. I am still not a huge fan of being in the hot sun when there is not a cool retreat nearby, and with baby due in the winter, it’s the first time I’ve ever looked forward to fall and winter as much as this year! I’m not wishing away summer at all, but it definitely helps cut the sting of summer beginning to near the end, especially after having such a brutal winter last year. A joyous day was just before Week 11 when our midwife came to our house and we finally heard that beautiful, loud, healthy heartbeat! She said the baby was definitely on the left side of my uterus, which according to this study, makes us wonder if Baby will be a girl. We’ll wait until birth to find out exactly, but we will be thrilled either way! This post is so long overdue it’s ridiculous. I feel like I’m constantly apologizing for my tardiness on this site. Going forward, I think it’s safe to say we all just need to assume I work on at least a 3-6 month delay. Anyways, last spring we started our built-in bookcases project in our living area. We had this blank open canvas of a wall to work with, and we always knew we wanted built-in bookcases. Our builder was going to need to charge us around $3,000.00 to do it, so of course like pretty much every other project in this house, we told him we would just do it ourselves. 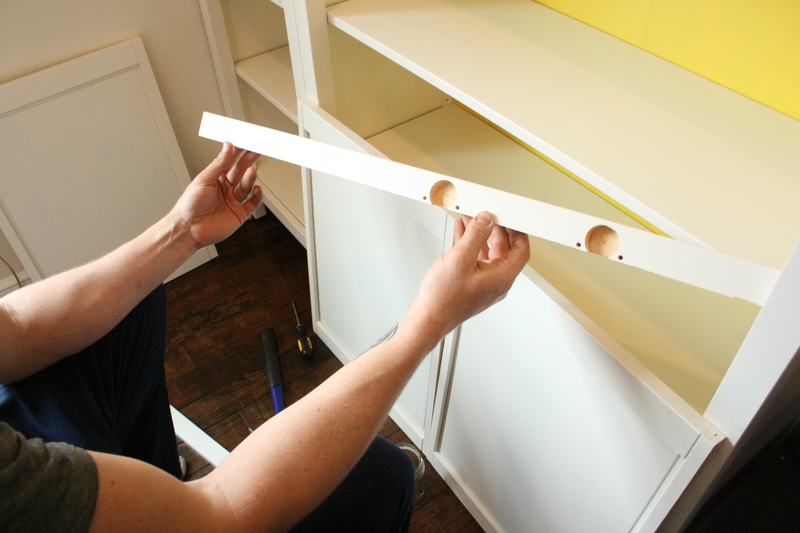 After some research, we decided to convert Ikea Hemnes bookcases into built-ins. Most people seem to use the Billy Bookcases which turn out beautifully, but Matt insisted on the better quality version using hardwood instead of plywood, and I wasn’t about to argue with something better! Visitors would walk in and go, “So… are the walls white?” IT’S CALLED “CREAM”, PEOPLE! Actually, it probably has an even more beautiful name by Behr. And so what if it was just white? There are plenty of opportunities to add splashes of color and texture to the space, but I was 8 months pregnant with my first baby when we moved in so it’s been a slow going process. Anyways, this is where our built-in bookcases finally come in! Matt putting the bookcases together in the middle of our living area with Baby L looking on. Look how little he was! We set the bookcases up to make sure they were in the right place and the TV would still fit. Matt made sure to spray paint the backing prior to putting everything together. This is what it looked like after building and installing the bookcases, but before adding cabinet doors and baseboards. Since we live in a 2-bedroom with an open living area, more hidden storage is always a necessity. So while Matt was in Ikea, he picked up some doors from one of their wardrobes to use as cabinet doors on our bookcases. He cut the panels down to the size we needed, picked up some hardware from Home Depot, and turned the bottom of our bookcases into cabinets! After he trimmed the cabinet doors down to size, he used the excess wood to trim the top gap between the doors and the existing shelf. Then he just used caulking to hide any screw holes as well as seams when we put everything together. Again, don’t miss the little helper! Matt cutting a piece of barn wood on the table saw. You can see the bare fireplace sitting on top his work table. The front of the electric fireplace wrapped in barn beams without the top on. The back of the electric fireplace wrapped in barn beams. Matt just adhered a piece of plywood to the entire back. This is the top of the barn wood fireplace mantel before being installed. And here she is in all her beauty! Here is an up-close shot of the fireplace that I took at Christmas after making my own grain sack stockings. This is what it looked like closed before we added a secret message. Matt had the brilliant idea to use stencil letters to put one of his favorite phrases on the wall, and still allow the door to slide open and close. L working hard, and playing hard too. It feels so good knowing we have completed an entire project that doesn’t still need any final touches or anything! Slowly but surely we are getting there, so thank you for following us on our long journey to building our “dream home”. It’s been awhile. A long while. I’m sorry about that. My excuse is because the disaster I called our home corner office space was in complete disarray for months. It was uninspiring and stressful. The homemade baby gate was no longer a good idea since our opinionated toddler wanted to be on the other side of it if I was. The open shelves were a bad idea from the beginning. I am not sure what I was thinking when we originally installed them? Hidden storage was a must. I also thought it was a good idea to have my desk “floating”, instead of against the wall, but the space just isn’t large enough. So for the time being until we figured out a better idea, I moved it against the wall and the filing cabinets to the left of it. So much better, right?! Please don’t mind the rest of the chaos. So for the next few weeks I researched ideas, and really liked the idea of built-in cabinets and desk, but we already had a desk so I tried to come up with an idea to utilize what we already had. I eventually decided I wanted to use a locker in the corner. My parents reached out to a fellow antique dealer who typically has industrial items and he happened to have a pair of lockers available for $100. Then a couple weeks later I decided more hidden storage would be necessary for my printer to be concealed, so I wanted to find an old cabinet to hang above the desk. We reached out to the same guy again and he suggested hanging an old shipping trunk on the wall. Brilliant! Even better, it says Erie, PA on the side of it. It was apparently for transporting the goods of a college student named Sue Richardson. Are you ready for the outcome?! Life changing, right? And I hardly got rid of a thing. Everything amazingly fit inside! We installed shelving in both units to make the most of each space. And I am actually allowed to say “we” this time because after Matt installed the shelving in the trunk, the next day I decided I wanted it on the opposite side, so I had to take it all apart and re-install it all by myself. So yes, we installed shelving. Matt had to separate the double lockers, and reattach the outside wall to this locker. We were even able to salvage the rest of the 2nd locker by installing it in the corner of the garage for more hidden storage down there. Look at all that beautifully hidden storage! Also, you don’t want to miss Kona’s reflection in the computer. -Spray paint filing cabinets the same color. Color TBD. Maybe tangerine. -Reupholster the chair, or find a new one with fun fabric or a bright color. -Adhere a pretty piece of fabric to the back of my desk to hide all the wires and be “baby proofed” for any future babies. -Get a basket to hold all the rolled up large papers that are currently hiding behind the couch. There is something about the post-holiday season that causes me to enter super organization mode, and from what I’ve heard, I’m not alone. My guess is that we put off a lot during the holidays, and afterwards we realize our living space is in complete disarray. So in order to keep our sanity through the long winter months (at least for us northerners), we feel this intense compulsion to find new order for any new gifts received and any indoor projects we may have put off all summer to enjoy the warm outdoors to it’s fullest. We graciously received a beautiful brand new Wok set this Christmas that has always been on our wish list, but soon realized it would not fit in our one and only available kitchen cabinet. Installing a hanging pot rack was on our ridiculously loooong to-do list and then instantly became a #1 priority. Since my husband was actually home for the weekend, we decided it was the perfect time to start the project. We knew it wouldn’t take much and we would feel so much better once it was done since we could check yet another project off the list that we put together when we first moved into our new home. Matt had come across an old metal tile layer awhile back and always envisioned it would make the perfect pot rack holder to hang from our ceiling above our kitchen island. He took some measurements and used a stud finder to see if any studs lined up anywhere close to where we wanted to hang it. Luckily there were two studs that worked perfectly. He used painters tape to make a rectangle the size of the old metal tile layer. Then he drilled holes in the ceiling on the four corners and put in little nail hooks. Do you like our little helpers? Then he put S-hooks on those nifty nails and hung chain from them. In order to get the exact length of chain needed, he hung one single chain on each long side connecting the two corners, then hung the metal tile layer from more S-hooks until it was level and at the height we thought worked best for us. It had to be low enough for me to reach, but high enough to not be in his eye view since we’re almost one foot different in height! He marked the chains in the appropriate places to later cut the links off that were not needed. Then once all four chains were in place, we hung our brand new old metal tile layer from the chains using S-hooks. We excitedly added more S-hooks in random places to finally hang all of our pots, pans, and stainless steel utensils! Doesn’t it look awesome? Our kitchen totally stepped up it’s game. Now we have a cabinet that has much more room to do more organizing, and our large utensil drawer opens and closes without getting stuck on random spoons. When I was pulling out our Christmas decorations over Thanksgiving weekend, I realized we had these big beautiful crocheted stockings a friend had made us, but no real nice ones for Big Guy or Kona. You may be wondering why I didn’t have this dilemma last year. Well, honestly, I can’t remember why. I am going to assume I just didn’t put stockings up? Cue mommy brain. Big Guy was only 5 months old last year and the fireplace is new this year (a post on that coming soon), so it probably just made more sense in my head this year. We obviously weren’t going to find matching stockings, and I’m trying to break out of my Type A tendencies and not always be so matchy-matchy, because even if something doesn’t match, it can still flow together beautifully. It just takes a certain type of balance that I am constantly learning to understand. So anyways, we have a bunch of old grain sacks that my mom had picked up along her antique dealing journey. I plan to one day make pillow covers out of them and sell them on our Etsy store. One day. For now though, I thought they would be the perfect fabric to make stockings out of! I was hoping we had some that were green and red, to “match” our other stockings, and lucky for me, we did! We actually had two different bags, but I liked this one better because of the stars. First, I flipped the fabric inside-out and personally just hand drew with a pen what I thought a stocking looked like. I am sure there are fancy pattern print-outs out there that you can find on the internet. You won’t find it here though unfortunately! I knew I didn’t want my stockings to hang so low they completely blocked our electric fireplace, and they had to be thin enough to be able to add more in the future. So this is what I came up with. After I drew my outline, I realized it was the size I actually wanted the stocking, so I cut about 1cm outside my perfectly scientific line to compensate for sewing room. I needed to make two stockings, one for Big Guy and one for Kona, so I then placed that stocking on top of more fabric, and cut along the same lines. You could draw it first, but I was feeling dangerous, and scientific, and just cut it. Then, I pinned the two pieces of fabric together (outsides facing together) and sewed a straight line stitch all the way around. Next, I flipped the top edge over about 1cm or so, and sewed the flap down. At this point, you may want to iron your stocking. I did not because I was too lazy to get it all out for these two little stockings. I excitedly flipped the stocking right-side out, and voila! A grain sack stocking! At this point, I realized I needed something for the stocking to hang by and didn’t feel like doing more sewing so I decided I would make a simple loop with some twine we had on hand, and hot glued it to the stocking. Again, this is really fancy scientific stuff over here. Then I needed to have name tags of some sort. Again, I didn’t want to do any more sewing, so I remembered I had some brown card stock paper I could use. I found some fun scissors I came across recently from back in my high school scrap-booking days to cut little rectangular labels out. Then I punched a hole in the upper left corners and wrote our names on them. I took more twine and tied the labels to each of the stockings. Aren’t they so cute? Especially so, with all their unscientific imperfections and non matchy-matchiness. Okay, I admit, they match pretty damn well. I honestly wasn’t expecting it though. They are still my personal gentle Christmas reminder to be forgiving of my own and others imperfections and differences. Oh yea! Remember how in my painted acorns post I said I wanted to paint some pine cones next? Well, I did. And they are awesome. All I had to do was spray paint them and let dry. Now, on to the next Christmas craft project… a wreath for my front door! I think I have officially entered hibernation mode. Clearly.